Strangely, strawberry varieties have origins all over the world. Some come from the Himalayas; others from Europe. Other types have points of origin from Japan, China, North America, and the Kurile Islands. Though strawberries have ancient origins, most of the earliest varieties were small, hard, and inedible. In ancient Greece, for example, strawberries grew wild. The Romans didn’t pay much attention to the fruit either, though they believed it symbolized the love goddess Venus on account of its shape and color. A few healers during this century prescribed strawberries to treat a range of ailments from fainting, liver ailments, to bad breath. The fruit continued growing relatively unnoticed, and the earliest illustration of the berry was in 1454. It was only until 1750 that the best known strawberry cultivar came about by sheer accident: According to the book, “Plant Evolution and the Origin of Crop Species,” a variant from Chile was placed next to a North American variant in a European home garden. The result was the delicious variety enjoyed by millions today. Presently, the Food and Agriculture Organization of the United Nations estimates that the world produces nearly 4 million tonnes of strawberry annually, with the US producing nearly a fifth of the world’s supply. Spain is a distant second, followed by Turkey, Egypt and Mexico, respectively. The parts of India growing strawberries commercially are Himachal Pradesh, Jammu and Kashmir, Uttar Pradesh, Maharashtra, West Bengal, Punjab, Rajasthan, Haryana, Delhi and the Nilgiri hills. Maharashtra’s Panchgani-Mahabaleshwar leads the country’s strawberry production, accounting for a whopping 85 percent of India’s supply. According to a 2012 “Financial Times” article, approximately 16,000 to 18,000 tonnes were expected for the year 2012 in this region. 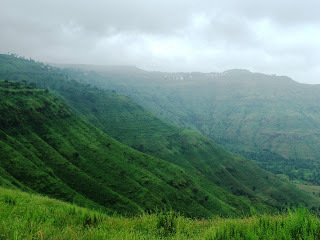 Himachal Pradesh and Jammu and Kashmir account for most of the remaining production. 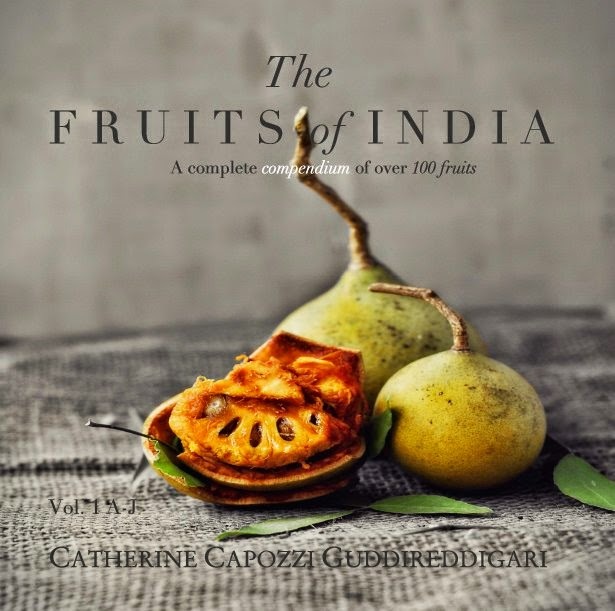 Approximately 20 varieties are of particular importance to the country, with each varying in their ratio of sweetness and end use. Though India is not known for its strawberries, it nevertheless exports them to other countries. According to the APEDA in New Delhi, the top export countries of Indian strawberries are Bangladesh, Austria, the US, Germany and Jordan. A type of wild strawberry classified as fragaria indica grows in the Himalayas, found from Indus to Assam as well as the Nilgiris and Khasia hills. It thrives up to 8,000 feet, but is not cultivated commercially likely because of its low sugar content and taste insipid and unpalatable. Fragaria sikkimensis is another variant native to the eastern Himalayas growing in the chilly elevation between 10,000 to 15,000 feet. However, this variety also lacks sweetness. India’s strawberry season is November through March. During these months, the fruits are available in most every major city. However, these delicious berries are seldom imported during the off-season: be sure to stock up on the fruits while they last. As a plus, strawberry demand is growing in every metro area of India. The same “Financial Times” article explains that while 50 percent of the demand for strawberries arises from tourists centered in Mumbai and Pune, more shipments are getting sent to Chennai, Goa, and Bangalore. Indian organizations are also attempting to raise awareness for the fruits by holding strawberry fairs and are enticing foreign companies to offer cultivation techniques. All of India’s important strawberry cultivars turn a bright lipstick red from its unripe hues of green and white. For improved shipping and preservation, farmers harvest the fruit when it’s three-quarters ripe, or, some white lingers on the berry. If growing the fruit in the garden, wait until the fruit reddens entirely, as this is when the berry is at its sweetest. Though color is an important give away, the single best indicator when purchasing strawberries is the smell. Deliciously sweet fruits emit a floral, sweet, earthy aroma. This gauge of sweetness only works on strawberries sitting at room temperature--chilled strawberries will not be aromatic, sweet or otherwise. Another interesting theory is that the distance of seeds on each fruit may be an indicator of ripeness. Tightly spaced seeds show that the fruit didn’t have much time to ripen before being plucked, whereas seeds far apart indicate that the fruit had time to expand and ripen fully before harvesting. Overripe strawberries appear withered and have lost their sheen. They may have bruises emitting fermented juice or are peppered with white mold—both are indicators to avoid. Also, check the bottom of the carton as well to avoid selecting any squished fruits harmed during shipment. 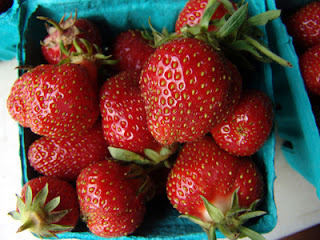 The best strawberries are fleshy and juicy in texture; their taste is sugary, tart, mildly floral and bright yet robust. Its subdued earthy undertones suit the strawberry to mingle beautifully with herbs like mint and basil; its tartness, with balsamic vinaigrette. Amazingly, over 300 compounds contribute to strawberry’s unique taste. Those in India relying on shipments of strawberries from far-off regions may be disappointed by the fruit’s lack of sweetness and tough texture—because Indian farmers pluck the berries when they’re not fully red, it’s quite rare to have sweet, succulent berries like those found in Europe and the States in regions of the country not growing the fruit. According to the book, “A Field Guide to Medicinal Plants and Herbs,” strawberries star in several folk remedies: American Indian tibes made root tea to act as a nerve tonic and treat stomach problems, gonorrhea, lung ailments, jaundice and heavy menstrual bleeding. The leaves and roots also treated bladder issues, scurvy, gout and diarrhea. In Europe, leaf teas were used as blood purifiers and to remedy kidney stones. --According to a 2009 study published in Phytomedicine, leaves from wild strawberries exhibit vasodilatory activities, thus showing positive effects on the body’s cardiovascular system. --A 2003 study by Cornell University published in the Journal of Agricultural and Food Chemistry found that human liver cancer cell proliferation was significantly inhibited after being exposed to strawberry extracts. 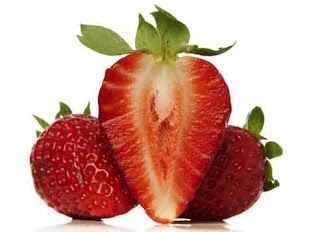 --According to a 2007 study published in Molecular Nutrition and Food Research, strawberry anthocyanins (in combination with other berry extracts) showed antiangiogenic, antiatherosclerotic, and possible cytotoxic activities against a pathogen known to cause gastric and duodenal cancer. --As per a 2006 study conducted at the University of California’s Center for Human Nutrition, strawberries markedly inhibited the growth of colon cancer cells. --As per the 2004 report, Potential Impact of Strawberries on Human Health: A Review of the Science, strawberries have potent antioxidants known to boost cardiovascular health, inhibit LDL cholesterol, assist with plaque stability, and reduce the risk of thrombosis. Additionally, the fruits possess anti-inflammatory activities. Certain compounds in the berries also possess anti-cancer activities by inhibiting cancer cell growth and tumor size. Lastly, strawberries have compounds offering benefits to the aging brain. *Note: Strawberries are some of the worst offenders when it comes to pesticides. Whatsonmyfood.org shares that strawberries have 54 pesticide residues, 9 of which are known or probable carcinogens, 24 are suspected hormone disruptors, 11 are neurotoxins, and 12 are developmental or reproductive toxins. Strawberries are quite simple to prepare, as they require no peeling, de-coring or de-seeding. Remove the leafy top and slice into desired pieces. As a tip, do not cut the top straight away, as this wastes fruit—instead, twist the leaves, and then use a small paring knife to remove the stem. Unless consuming immediately, keep fruits in the refrigerator. Keep the fruits on the counter top 10 minutes prior to consumption, as chilled fruits have less flavor than ones at room temperature. Strawberries bruise quite easily and should be kept as dry as possible. To maintain these ideal conditions, line an airtight container with a paper towel and place strawberries far apart from the other. If a second layer is required, place another paper towel atop the first and line the fruits in the gaps between the lower layer. Harold McGee wrote a New York Times article offering an additional storage method that works for a variety of berries: drop the fruits in hot water (approximately 125 F) for 30 seconds, and then store as outlined above. This technique extends the life for another week, perhaps two. Whole strawberries keep in the freezer for six months to a year, depending on when signs of freezer burn encroach the berries. This will be evident by too many ice crystals surrounding the fruits, and the berries will have an “off” taste. Strawberries are versatile fruits, allowing for baking, boiling and chilling. These fruits can be blended, pureed, sautéed, grilled, mashed, and undergo several other cooking techniques. --Make a frozen strawberry margarita or daiquiri. Mix with lime or lemon juice, peach, pineapple, mint, or other berries. --Make strawberry syrup by reducing the puree in sugar on the stovetop. Add this syrup to sparkling water as a healthy soda option. --Add to any smoothie recipe, as it pairs very well with bananas, other berries, vanilla, cacao, and any other nut milk. --Include strawberries in any salad recipes with walnuts, almonds, grapes, dark greens (such as spinach, rocket, or arugula) and faux cheeses. Light vinaigrettes work best with this fruit, and their brightness will become weighed down by cream-based dressings. --Combine a handful of strawberries in creamy raw vegan soups, especially those featuring bell pepper and tomatoes. --Include sliced fruits in granolas and mueslis. --Dehydrate strawberries and add to trail mix. When freeze-dried or dehydrated, strawberries become tangy, sour, and only mildly sweet. --Make fruit skewers, adding kiwi, other berries and bananas as possible complements. Dip the fruits in a sweet vegan whipped cream sauce, or chocolate sauce. --Chocolate covered strawberries are classic and quite easily made by melting baker’s chocolate in a double boiler. Roll the fruits in the concoction, and then drizzle strawberries with caramel, white chocolate, or sprinkle with nuts. --Make strawberry pie by mashing the fruits and heating them on the stove with sugar. Transfer the sweetened, gooey mix to a nut and date-based piecrust and add desired topping. 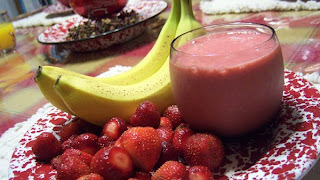 --Add pureed strawberries to cupcake, muffin and sweet bread or ice cream batter. It’s also possible to add pureed strawberries to make fresh frosting as well. --Strawberries are a mandatory pairing for angel food cake, along with whipped topping. --Make a simple raw vegan tart by leaving the sliced berries to soak in agave syrup (or date syrup) for a few hours. Prepare a crust by mixing nut flour with dates, and then pressing it into the pie dish. Add the strawberries, and consider serving with banana ice cream, macadamia nut whip cream, or drizzling the top with raw chocolate sauce. 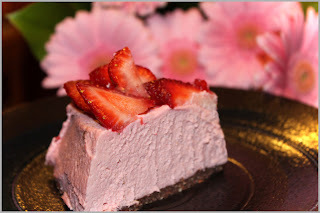 --Or, make a raw vegan cheesecake by folding pureed strawberry into a cashew nut batter. --Make strawberry popsicles by blending the fruit, sweetening as desired and freezing. It’s possible to make a creamsicle by whipping the fruit with coconut oil, vanilla essence, and any nut milk, followed by freezing the concoction. Though most people think of the small, red, pointed fruit covered with yellow seeds when they hear “strawberry,” Fragaria is an exceptionally diverse genus. Berries come in several shapes, sizes and colors that some may find surprising. Another variant originating from South America is called the “strassberry,” which is a raspberry/strawberry hybrid. Fragaria daltoniana, on the other hand, appears white with black seeds. Others, like the alpine strawberry (Fragaria alpina) may stay stubbornly but sweetly white. Some alpine strawberries are bizarrely yellow as well. Fragaria viridis taste delightfully sweet… even though its color always stays greenish white with only a hint of pink. Woah, awesome recipes! I'd kill for even a tenth of your culinary skills. =) I just subscribed and am following you on Facebook--it's always great seeing the creativity of fellow vegans. Cheers! I am hoping that you would be the answer to all my questions and anxiety. I love my strawberries (I mean, who doesn't) and I would love to grow some on my patio or balcony. I have done a little research as to some of the varieties, but my question is how well would strawberries grow in a place like Central A.P (Hyderabad)? And if, so.. then what variety would yield the best fruit and successfully grow in this climate? Unfortunately, I'm not a gardener (I'm awful with plants, actually) and can't answer your question very well. That said, strawberries grow in all sorts of climates, and that includes Hyderabad's. I grew up in a state that reminds me of Hyderabad's weather, and people had flourishing strawberry gardens in their backyards. The biggest problem they had was preventing the scorching sun from drying them in the summer, but shade fixed that issue. So I definitely think it's possible to grow them. Not positive on the varieties. Maybe check out these guys? Good luck, and I do hope you grow some delicious berries! And one more thing: Camarosa and Chandler are two varieties that grow well in Arizona, and are also ones that I believe could grow in Hyderabad. Fragaria vesca plants grow wild there, which are a type of evergreen strawberry. Hopefully this points you in the right direction! Chandler grows well in Punjab and himachal.i get calls from as far as west Bengal / hydera bad / Bombay.many young people want to try it.I can guide people from north to grow strawberry . pl call me at +91 9041297432. HI Catherine, is there any way I can get in touch with you. A mail id perhaps. I am a journalist working in New Indian Express, and am looking for ideal people to talk to about strawberry cultivation in India; as I am doing a story on the same. Can you please tell how to protect the Strawberry plants in scortching heat during summer in North India. The temp in May and June raises to 40 degrees. BRAR STRAWERRY FARMS > India's successful youth strawberry grower "all Varieties :- Chandler , Camarosa , Ophara , Winterdown And Sweet Charlie . "Nearly 32,000 plants can be grown on each acre of Land . Each plant will cost ( 3 ) rs .The Fruit is transplanted from September to October and It starts repining in February and goes on till May . What can be better than a juicy, red, flavourful and sweet strawberry? A self picked, farm-fresh juicy, red, flavourful, sweet strawberry of course! Laxmi Strawberry Farm is situated in the heart of Strawberry Fields in Mahabaleshwar, Amidst the valley offering the most panoramic view. Laxmi strawberry farm is situated in the heart of strawberry fields in mahabaleshwar, Amidst the valley offering the most panoramic view. call on 9420628395.